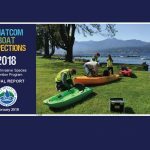 Among the most damaging AIS that could appear in Whatcom County are the zebra and quagga mussels (Dreissena polymorpha and Dreissena bugensis). These invasive mussels are native to Eurasia in the Black, Azov, and Caspian Sea drainages. They did not appear in North America until the mid-1980s when they were brought to the Great Lakes by large, transoceanic ships in ballast tanks or on anchor chains. 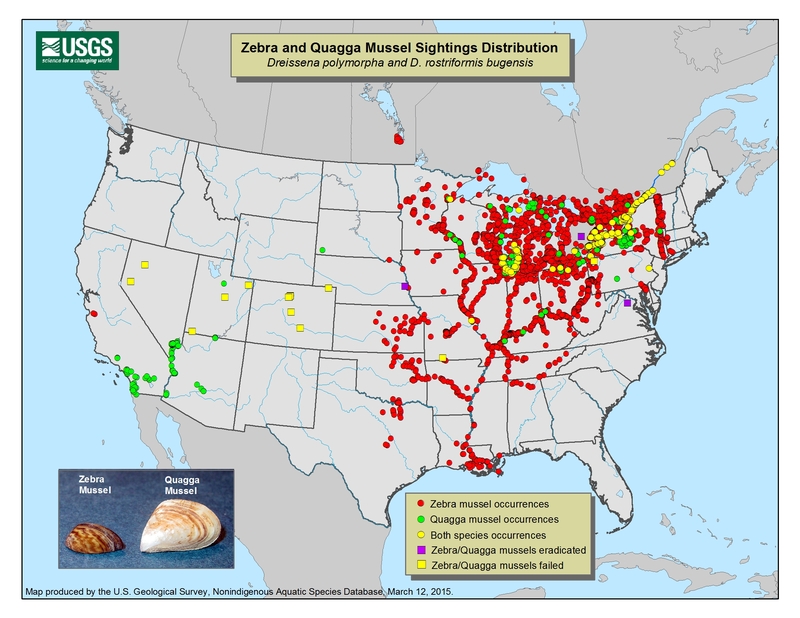 These very small freshwater mussels have now wreaked havoc throughout much of the United States since their detection in the Great Lakes in the late 1980s. 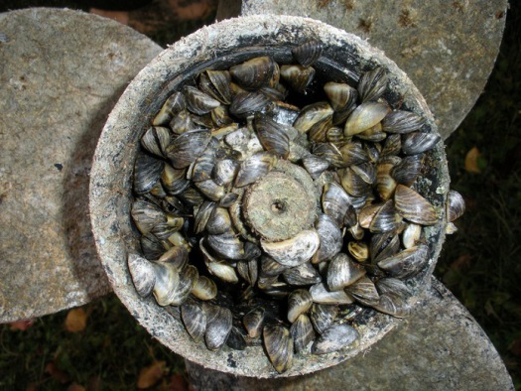 Zebra and quagga mussels are fingernail-sized freshwater mussels that range in size from 1/8 to 2 inches in length. Their shells are typically marked by alternating light- and dark-colored stripes and range in color from yellowish to darker brown in color. Unlike native North American mussels, these mussels are capable of attaching themselves to a large variety of substrates using byssal threads. 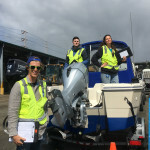 This adaptation allows zebra and quagga mussels to spread easily to uninfested waterbodies by hitching a ride on boat hulls, motors, and recreational equipment. 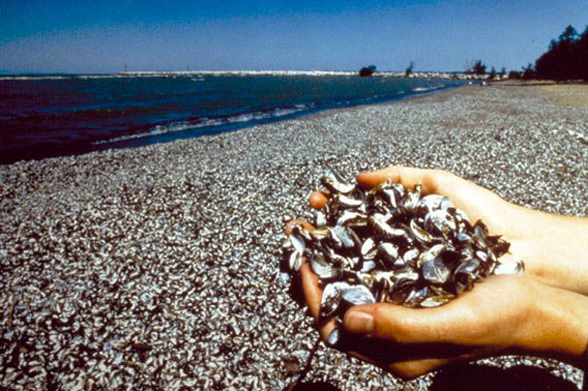 In 2007, quagga mussels were discovered in the western United States at Lake Mead, 1,000 miles farther west than any other known quagga mussel infestation at the time. Today, either one or both species are now documented in California, New Mexico, Arizona, Nevada, Colorado, and Utah. 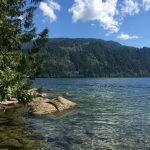 The closest currently known infestation of quagga mussels to Washington is located in Nevada – approximately a 16-hour drive from Whatcom County. This may seem really far away, but adult mussels can live out of the water for up to 30 days when the air temperature and humidity are ideal. In July, an adult mussel might be expected to survive out of water in northwest Washington for an average of 12 days, depending on the weather conditions. That’s plenty of time to drive from Lake Mead to Lake Whatcom! Mussel Prevention Program, San Luis Obispo Co., Calif.
A female mussel is able to produce up to one million offspring per spawning season and while they grow, they attach very tightly to hard surfaces causing damage to water intakes, filtration equipment, boat hulls and motors, and other personal property. Mussel densities of well over 100,000 per square meter have been observed in several waterbodies, resulting in billions of dollars in damages and estimated annual control costs of at least $1 billion nationwide. While adult mussels are fairly visible and easier to spot, it is the immature form – veligers or larvae – which are virtually invisible in the water that pose the bigger detection problem. This is why it is very important to CLEAN, DRAIN, and DRY everything that has been in a lake to prevent the spread of these mussels. Report Sightings: Call 1-877-9-INFEST or report online. 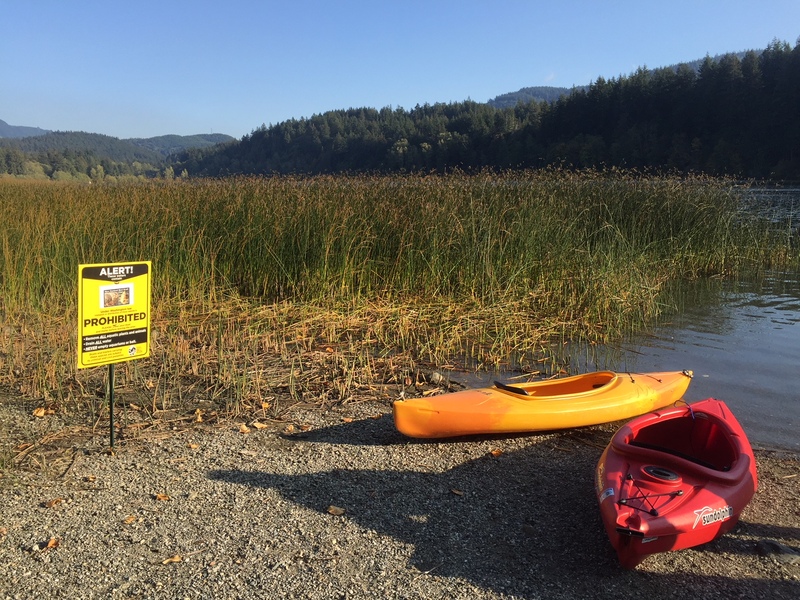 In July, an adult mussel might be expected to survive out of water in northwest Washington for an average of 12 days, depending on the weather conditions. Visit the drying time estimator to find out how long you should wait for your boat to dry when coming from infested waters. 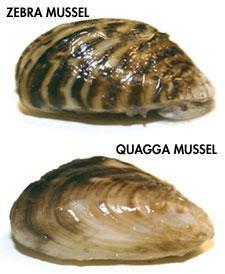 A single female quagga mussel can release up to 1 million eggs a year! 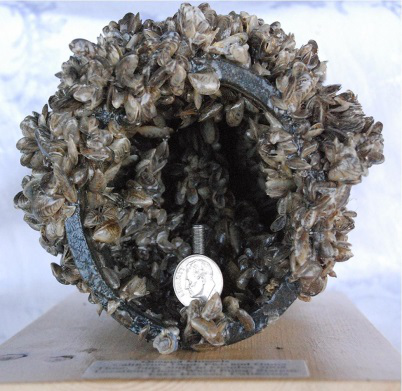 Even if only ten percent of the offspring survive, there would be 10 septillion mussels in the waterway at the end of 5 years!